Admit it – there may be a time when you simply threw around stats to impress a prospect. It shouldn’t be that way. The moment you open a conversation with a prospect and talk about a product they have yet to understand is the moment you’ll lose the sale. But, not if you have a well thought out SEO proposal that makes it easier for your prospect to understand what impact your service can bring. By studying the best practices in selling SEO and incorporating sales knowledge, we’ve created a template that will help your agency stay on top of your prospect’s mind the moment they decide to get SEO services. You’ll find all the essentials here with our SEO proposal examples and template that you can use to close your next client with. What Should Be in Your SEO Proposal? Selling SEO services involves a lot of explaining to prospects the nature of the work and the value that a well-planned and well-executed SEO strategy brings to their business. But, not all sales people win in this aspect of the conversation, and it’s all because of how their SEO proposal falls short. What can you do to address the client’s problems? What will the client benefit by addressing these problems? From the different SEO agencies out there, why should they trust you? If your proposal can address these questions at a glance, it will be easier to hook prospects and guide them into making a decision. The Overview section is the first thing that prospects will see when they read your SEO proposal. In most cases, this states the purpose of the proposal so you can set your clients’ expectations from the very start. Be brief – Don’t bombard your clients with too many facts at the start; you’ll have plenty of opportunities to explain your service further in your proposal. Be clear – Remember that you’re sending a proposal to people who might not have heard of SEO; avoid using too many jargons and stick to verbiage your prospects understand. Your proposal is part of your SEO pitch. Just like when you’re pitching your SEO service to a business, one of the first things you do is introduce yourself. Use this section to tell clients additional information about your agency. Sell yourself and give clients more reasons to work with you. Core values – Show them what principles drive your agency to get results for clients. Track record – Give them a short glimpse of what type of clientele you have under your belt. This can serve as additional proof of expertise. Value proposition – Indicate what separates your agency from the rest and why clients should hire you for their SEO services. Do you offer premium services at lower rates? Do you specialize in a specific aspect of digital marketing? Credentials and accreditations – These are additional references that you can leverage to set yourself apart from other agencies. Despite the growing number of businesses subscribing to digital marketing services, a portion of the market still has little to no knowledge of SEO. Your proposal can also serve as a brief primer on what SEO is and how this helps a prospect’s business. This section is where you outline the benefits of SEO and translate its value in terms they can understand. It’s important to make sure your clients understand that the benefits of SEO go beyond rankings; show them how this can affect their business in the long-term. SEO helps in building your authority online. A strong organic presence helps you get more leads for your business. With SEO, you can improve your brand’s visibility to your target audience. When identifying the benefits of SEO to your client, find the right angle by hitting different value propositions and seeing what they have the greatest affinity to. It’s time to talk about your action plan. Think of this as the meat of your conversation. By diving into the specifics of your SEO strategy, you’re showing clients a methodology that delivers real results. Website Assessment: What’s the basis for your SEO strategy? A website assessment indicates how your agency identifies the SEO needs of your client, as well as the goals of their business. Campaign Roadmap: This shows the strategy developed following the initial assessment done on a client’s website. On-Page SEO: This forms the technical aspects that will be implemented on the client’s website to further improve their rankings. Off-Page SEO: A comprehensive SEO strategy comes in two-folds, and this aspect covers the second part of that strategy. Off-page SEO can include a wide array of activities that supplement your on-page efforts. Reporting and Analytics: One of the strengths that you should put forward when you’re proposing SEO services is your ability to translate your efforts into value for a client’s business. 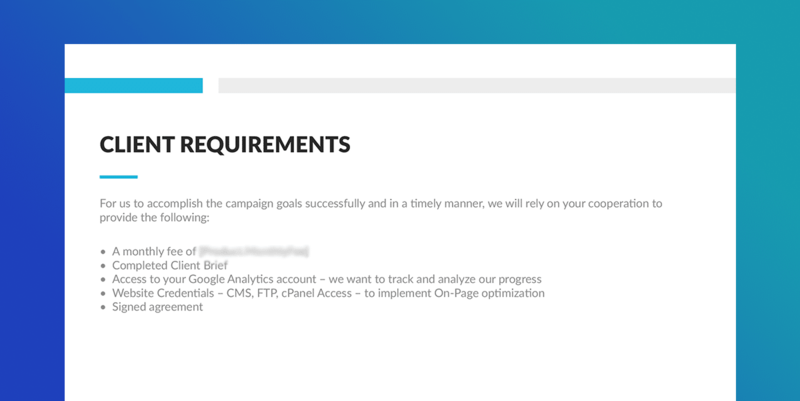 This aspect tells clients that you have the capability to report on the progress of their campaigns. You want to set the expectations of your clients and provide them with a clear view of how their project will be progressing. This is you selling transparency. 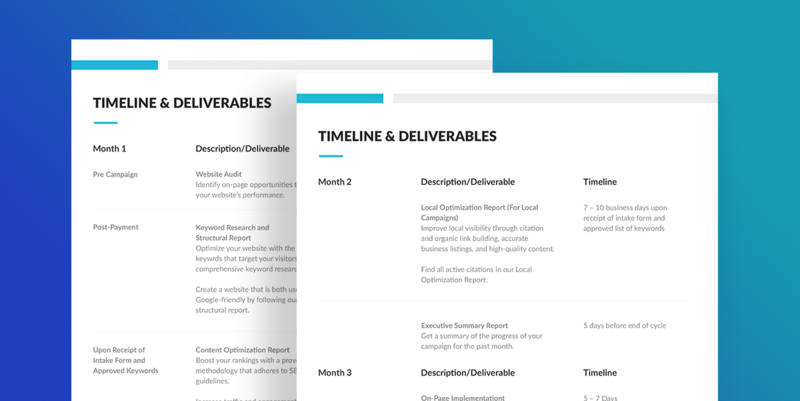 A detailed breakdown of your timeline and deliverables can serve as the overall forecast of their project, as well as your agency’s responsibilities and output in chronological order. The ultimate goal of an SEO proposal is to prompt clients to sign up with your service—in short, you need to have a call to action to get them onboard. If your prospect needs a little more convincing, don’t be too shy to throw some social proofing and testimonials from clients you’ve worked with. This is your time to brag about the work you’ve done for previous clients and show them how your service has an impact on their business. Remember Step 0? Don’t skip it. Doing prep can make a big difference in how you position your agency when you’re pitching to SEO prospects. If you haven’t done your homework and taken the time to know their needs and business, you’ll have a less effective pitch. The most effective way of pitching with your SEO proposal is through storytelling. Notice how the proposal above is arranged in a logical manner and doesn’t simply jump to the timeline and deliverables section. When you pitch using an SEO proposal, don’t jump into the details of your service without explaining the value it offers. If you do, you’re giving prospects an opportunity to jump into objections early on. Let your client view themselves as the “hero” and you’re there to help them strategize and execute their SEO plan that enables them to win more business. Ever heard of a pitch kit? Be sure to have one prepared. This should include impressive marketing materials that you can use to supplement your proposal, such as a case study, a white paper, or even an infographic. 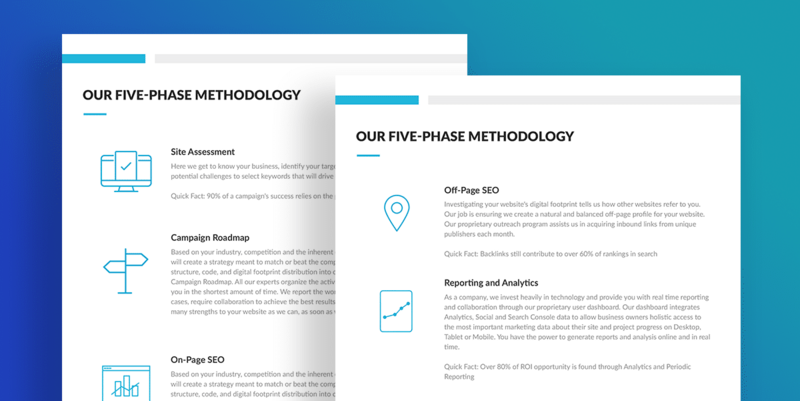 Our downloadable pitch kit comes bundled with an SEO proposal sample, case study and pitch deck. The more materials you have on hand, the easier it will be for you to showcase expertise. 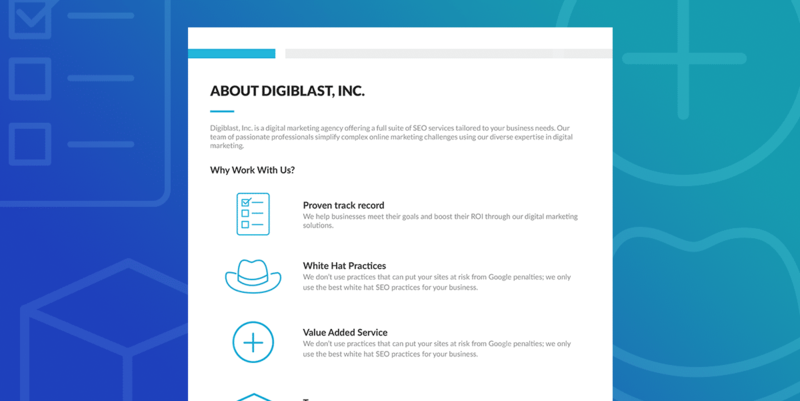 Pitching your SEO services should be as easy as counting 1, 2, 3, and you can do so with a well-written proposal on hand. You don’t have to start from scratch – that’s what this template is for! 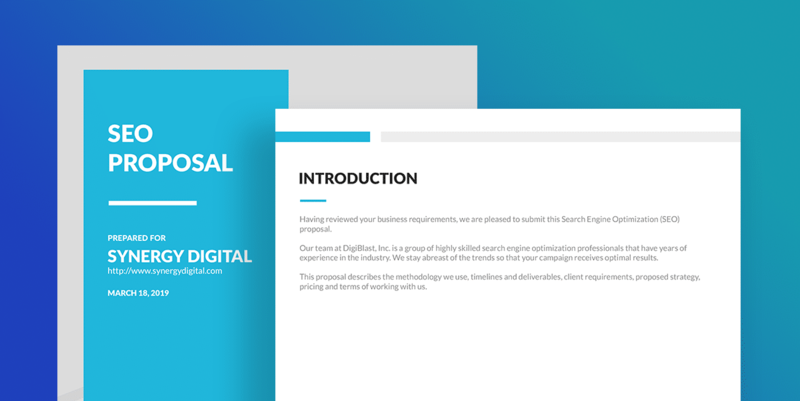 If you’re stuck with a proposal that doesn’t convert, now’s the perfect time to switch to this SEO proposal template. Build using our Proposal Builder—it’s easy to use and highly customizable. Sign up, see how it works, and tell us how your pitch goes!